Size: Maybe around 2 mm? OK, I know that my camera has no business taking pictures of anything this small, but just LOOK AT IT! How could I not try? The size is NOT counting the "nose". I'm uploading a ton, frassing a bunch (wait for it), but hope someone sees something of value somewhere in the dump. Best ideas so far Myrmex, Attelabidae. 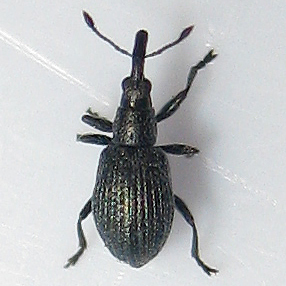 another Ischnopterapion virens (White Clover Weevil) ? nice series; i'll pick a number of pix for the guide. Did I measure it properly (back to front of the eyes)? I didn't even look through Brentidae because I thought they were all cigar-shaped (Arrhenodes often hogs the browse images). your pics are awesome no matter what..i enjoyed them! Nirvana is when all pics at BG.N (and MPG) look this good. I'll never be satisfied with the quality. Even when I find a common insect I have shot dozens of times I try again and again just in case it is a better specimen or I get some new detail. That's why I shot 10-15 thousand images last year. Most were deleted right away, then the rest go into folders for future ID and when I finally get to it I sort through all of those from any given species (there may be hundreds) and try to post the best of the lot. For new IDs I may post more images when I'm not sure of the important details. I always say that I don't take good pictures I just delete bad ones!